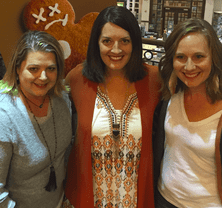 In early October, I was so excited to share with you about a book signing I attended with a taping of the Say Something Show for author Melanie Dale who was releasing her latest book. I related personally with the title It’s Not Fair: Learning to Love the Life You Didn’t Choose. Like Melanie,I also struggled with infertility with our first child. Recently as my husband’s twin sister and her husband with three children were both diagnosed with cancer within a two weeks of each other and we lost Dwight a year ago, I’ve heard refections of the unfairness of life often. You can keep up with their story on Facebook. Little did I know that days after the taping, a torn rotator cuff and urgent surgery due to intense pain would leave me struggling with my own “It’s Not Fair” season of life. As I continue to recover from surgery with physical therapy and return to the counseling office and caring for my children, I am reminded of some important life lessons. I’m looking forward to sharing with you and can’t wait to hear from you ways you’ve worked to overcome your own “It’s Not Fair” thoughts and moments. Asking and receiving help humbles us in a way that benefits our character. I am so grateful for family and friends who during the last several weeks, fed me and my family meals, went to the grocery store, picked up one of my children, or even drove me somewhere during my season of being restricted from a freedom I’ve valued since adolescence – the ability to jump in my car and GO! With this surgery being totally unplanned, I also was in charge of our elementary school Santa night and the room mother for two children’s Christmas celebrations. Many a fellow parent and friend came to my rescue and literally lent what I needed most – a hand – as I participated in all of this with an arm in a sling. My staff have stepped up handling many of my administrative and leadership duties at the center as we’ve added staff and moved an office preparing to launch a free counseling grant. The holiday season is a busy time and I hope as Christmas approaches and the last minute details create a demand for what seems like all we’ve got, we can all take a moment to ask and receive help – whether it’s a door being held, an errand being run, a child being watched or maybe what many souls long for – a visit from a friend as I received this week. I participate in a couple of Facebook mom groups and some of my favorite stories are those where people share a local need and how we can make a difference or even better when an unexpected kindness or moment of generosity came their way. It doesn’t take an illness or an injury in this chaotic world to appreciate a little help and encouragement from our friends. I’d love to hear ways you’ve seen kindness demonstrated in the comments below because it might inspire someone else. One thing reading these posts taught me is that there are many families struggling in our schools to clear lunch balances for their children. What a great way to lend a helping hand by allowing a child whose family falls in the gap between qualifying for free/reduced lunch and having the resources to provide somehting many take for granted. Love this festive shirt currently on sale from Simply Bliss. The Say Something Show taping I viewed was sponsored by Shop Simply Bliss – an online Christian boutique. In the above photo, you can see some of their clothing on myself, author Courtney DeFeo, and God Centered Podcasting Mom Heather McFayden. I love their company mission and as the weather here in Texas went from the 70s to 20s, sweaters like the one I’m wearing not only provide warmth, but I love the longer length for boot weather. They also have some great vests, fashion tees sporting Christian inspiration and undergarments for longer layered looks. I am super excited to giveaway at $25 gift card to one of my Counselor Thoughts blog readers or Facebook fans! Make sure you share a comment on either Facebook or below on this blog post. It’s Not Fair: Loving the Life You Didn’t Choose with Melanie Dale, Kay Wyma, Courtney DeFeo and Erin Schreyer. I love to hearing how God works through others to meet someone’s needs. Feel free to share below a story or an idea like clearing a child’s lunch account so that all of us can continue to spread joy in the midst of life’s struggles. Anyone who comments here will be entered to win a $25 Simply Bliss Boutique gift card.